The Sticky Joys of Frozen Custard You may think you've seen frozen custard. More likely it was swirly soft-serve ice cream. Frozen custard is different. Liz Davis of the Del Ray Dreamery in Alexandria, Va., explains why. 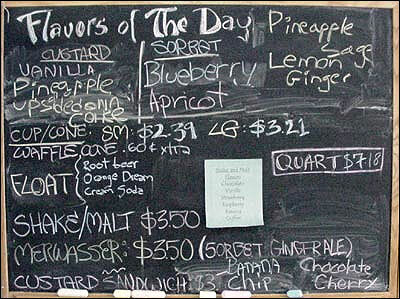 The Dreamery's chalkboard keeps customers up to date on flavors. One of summer's greatest pleasures is cold and luscious. It tastes like the county fair and the beach, the picnic and the park. It's a great, great Amerian classic of small Midwestern towns, and yet because it's hard to make, it's a rare treat. It's frozen custard. You may think you've seen frozen custard, but what you more likely saw was gold, old-fashioned, swirly soft-serve ice cream. 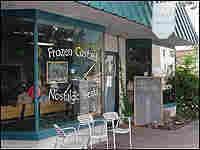 Frozen custard is something completely different. Liz Davis of the Del Ray Dreamery in Alexandria, Va., explains a phenomenon.